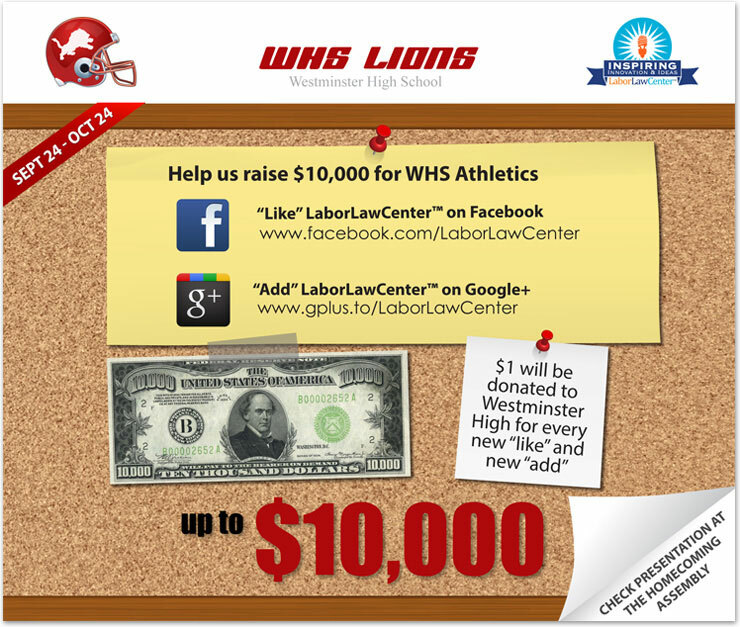 Westminster High School on Goldenwest between Westminster and Hazard will receive $1 for every “like” on Facebook and for every “add” on Google+ that LaborLawCenter receives on their company social media pages. The money raised will be used towards the Athletics program. Athletics is one of the foundations of the high school experience and Westminster offers a number of athletics teams which compete in the Goldenwest League. It was our pleasure to award Stella's Hope with the Summer Grant Giveaway valued at $1,142. Stella's Hope is an all-breed, no-kill dog rescue. They rescue dogs in need and are dedicated to reducing the number of adoptable and not so adoptable dogs that are euthanized in shelters through rescue rehabilitation and rehoming. We would also like to thank everyone who participated, and be sure to check for more giveaways from LaborLawCenter™ to come!" The aroma of crisp baked bread with warm melting mozzarella cheese and sweet rich ripe tomato sauce reached their nostrils as they saw a black pickup truck filled with pizza boxes approach the curbside. 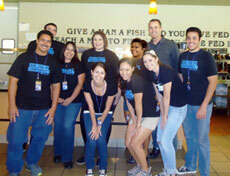 Residents and staff at the Orange County Rescue Mission knew immediately that they were in for a treat! Christopher Yagerman and his wife Courtney journeyed a mile and a half to the local pizza parlor to pick up 50 large pizzas to feed the 200 residents and staff at the Mission. Yagerman is one of the employees from LaborLawCenter who dedicated their Saturday morning to serve lunch. LaborLawCenter is a leading compliance poster company in the United States, providing compliance solutions to small, medium, and large businesses nationwide. This outreach is part of the company’s ongoing efforts to give back to the community. "LaborLawCenter is a socially conscious company committed to giving back to the communities where we live, work and serve," said Mary-Joy Gamueda, Marketing Manager. OC Rescue Mission is a transitional housing facility for homeless men, women, and children. The kitchen staff normally takes the weekends off, so companies are encouraged to sponsor a lunch to the residents. The pizza lunch is a favorite treat by the residents as well as the soda because the Mission usually provides just juice and water. The salad was hardly touched, though the ranch dressing was repeatedly visited for dipping. "It was well worth the time to see the smiles that we brought to people's faces," said Yagerman about the experience. Kevin Boyle enjoyed his time and said, "I'm glad to be part of touching people's lives." LaborLawCenter is hosting a FREE e-waste recycling event designed to help area residents, small businesses, and organizations dispose of electronics in an earth-friendly way. The one day collection event is scheduled for Saturday, March 10, 9 a.m. – 3 pm., at the LaborLawCenter Warehouse parking lot, 12771 Pala Drive, Garden Grove, CA 92841. Enter from Acacia Street off Knott Boulevard. According to the US Environmental Protection Agency, e-waste is the fastest growing waste stream in America and account for a large percentage of our hazardous waste. 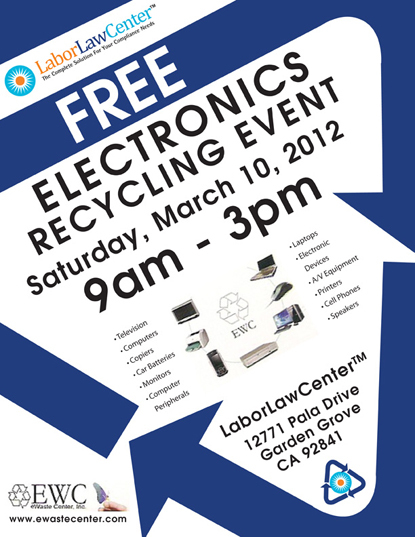 To combat the growing problem, LaborLawCenter has partnered with e-Waste Center (EWC) to collect and dispose the following electronics properly. televisions, computers, car batteries, laptops, printers, cell phones, etc. Please tell your friends about this event and encourage them to tell everyone they know. As a community, we can contribute to preserving the environment for future generations. Oxford Academy is the recipient of the LaborLawCenter™ “Inspiring Innovation and Ideas” grant. They will be awarded $1 for every “like” on Facebook and for every “add” on Google+ that LaborLawCenter receives on their company social media pages. 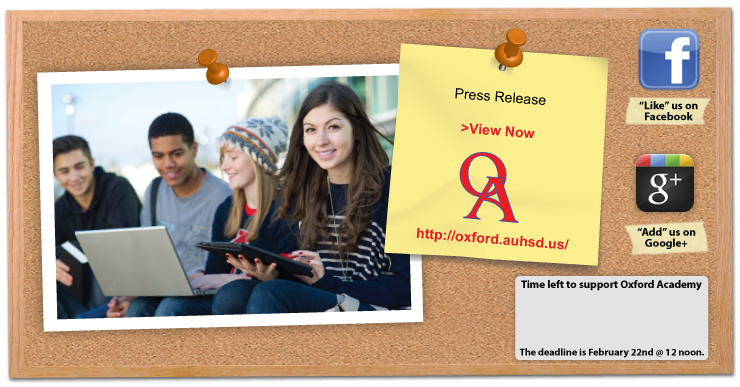 Oxford Academy (OA) is a college preparatory public school of choice serving students in grades seven through twelve. Recognized as a California Distinguished School, OA draws students from the entire attendance area of the Anaheim Union High School District. They were recently ranked #4 on US News & World Reports’ list of “Best High Schools” and #19 on The Washington Post’s ranking of America’s high schools. The mission of Oxford Academy is to prepare students to be ethically and academically focused for entrance into college. The campus is ethnically and socio-economically diverse with a student body consisting of 61% Asian, 15% Latino, 11% white, 10% Filipino/Pacific Islander, and 2% black students. The funding provided by LaborLawCenter will help sponsor economically disadvantaged students on college visits. These visits will inspire innovation and ideas in the students that will serve them well as they pursue higher education.